A US-based company has recently organized a sensitization program on the need and importance for students to do Science and Math subjects in schools. DOW Chemical West Africa, a global company based in the United State of America held the two-day sensitization forum for students from Muslim Senior Secondary School and St-Joshep Senior Secondary School for Girls. According to officials, DOW Chemical Company is an organization operating in over 175 countries with the aim of promoting Science and Technology Engineering and Math (STEM), Agriculture, Packaging among other things. During the interactive forum, students were given the opportunity to ask questions pertaining to Science Technology and Math. In his remarks, one of the leaders of DOW Mr. Lanre Dairo, said DOW Chemical is a science and technology company and their mission to the two schools is to encourage the young one to improve their knowledge and interest in science and technology and math. He thanked Muslim and St Joseph SSS for accepting to partner with them and assured that they would continue doing it as they find that the students were very much interested and have participated well during the forum. Mr. Lamin Dibba, a Gambian based in United States and part of DOW Chemical Company also reiterated that their purpose of coming down to the Gambia was to encourage young people to take up STEM education seriously, adding that during his time in school students used to do away with science having the concept that the subject was difficult. With the forum, he expressed hope that the students would now take up science and math seriously. 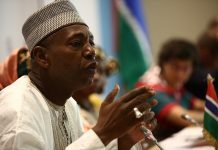 He noted that political leaders also have a role to play in promoting math and science in the Gambia adding that it is difficult to teach some of the science subjects like physics, biology chemistry without equipped labs to use. He said lack of labs and material are one of the problems why students run away from science. Madam Adwoa Coleman from DOW Chemical gave a long presentation on what DOW was all about and the importance of Math and Science. She urged the students to take science seriously as people are now living in a technological world. For his part, the principal of Muslim SSS, Mr. Lamin Marong thanked the DOW Company for choosing his school to sensitize students on the importance of Math and Science and Technology. He notes that science is the major concern his school faces due to lack of the necessary equipment in the school lab. He thus thanked DOW and urged the company to continue the partnership.